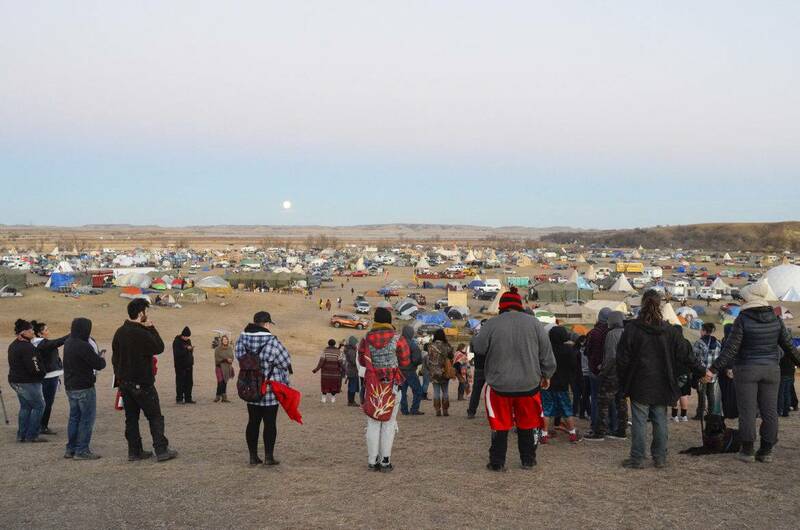 For the Standing Rock Sioux Tribe, the effort to block the Dakota Access pipeline –an effort that attracted thousands of protesters, including members from hundreds of different Indian tribes across the nation—is about much more than oil, or water. It’s also about religion. The proposed $3.8 billion, nearly 1,200-mile pipeline runs through sites on the North Dakota prairie the tribe considers sacred. But that spiritual connection to the landscape can be difficult for non-tribal members to understand. “Archaeologists, they don’t see these,” said former Standing Rock tribal historic preservation officer Tim Mentz on a YouTube video posted this fall in front of a swath of land bulldozed by Energy Transfer Partners, the company building Dakota Access, to prepare for the pipeline. In the past, commercial development often occurred with little regard to its impact on Native American culture. But in recent years, tribes across the west have exerted their growing influence to protect sites they consider sacred. And this effort isn’t just occurring on Indian reservations. Tribes are also demanding they have a say on thousands of acres of land where they used to live, on land they ceded to the federal government through treaties. That’s resulted in clashes over proposed oil refineries and mines, solar and wind projects, a ski area expansion, and now, an oil pipeline. As a result, it can sometimes seem to developers and the government that tribes “are going to take back the entire west,” said Sarah Krakoff, an Indian law professor at the University of Colorado. “But in reality, when we’re talking about sacred sites, often tribes can live quite comfortably, as long as the proposed development doesn’t exclude and wipe out the possibility that tribal people can continue to access and honor and engage in their rituals, and ceremonies around those sacred spaces,” she said. That’s a possibility, said Krakoff, if companies and the government properly consult with tribes while energy and other kinds of infrastructure projects are being developed. But many experts say that’s often not the case, even though consultation is required by laws like the National Historic Preservation Act. “When I work with tribal leaders, they spend a tremendous amount of time and energy attending consultations with federal agencies, only to find out that the agency gives lip service to the information they have shared, and goes ahead with its plans anyway,” said Kristen Carpenter, a visiting professor of Indian law at Harvard Law School. That’s exactly what has happened with the Dakota Access pipeline, the Standing Rock Sioux Tribe argues. The tribe says it was not consulted early in the process, although a federal judge ruled the Army Corps did follow the law when it reached out to the tribe. Carpenter and other tribal attorneys and advocates hope eventually the government moves toward a standard that uses consultations not just to collect input, but to come up with binding, mutual agreements that address the concerns of both tribes and the government. But while tribes are rightfully upset with the level of consultation they often receive, energy companies are equally frustrated, said Denver-based attorney Troy Eid. For his part, Eid believes a compromise can be reached that allows for meaningful tribal consultation and expedites needed energy projects. Tribal attorney Gabe Galanda in Seattle is less optimistic. Something most experts agree on, is that with an emboldened core of Native American activists advocating for tribal rights, and a growing push for more infrastructure projects in the energy-rich west that’s expected to accelerate under a Trump administration, more conflicts like Standing Rock are likely in the future.